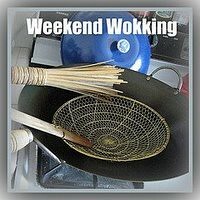 We were a little bit stumped with the ingredient for this month's Weekend Wokking. Afraid to lose our "street cred" (haha), we wanted to make something that would be unusual and use the lemon in its various forms. sweet lemon lollipops covered with lemon salt, or lemon zest-scented polvoron topped with lemon curd, or "molten lemon cake". lemon chicken, or lemon gnocchi with an avgolemono-type sauce. In the end, I hope that we came up with something that is a unique [eatingclub] creation! A tiramisu should "pick one up", correct? What better way to revive someone than with the refreshing scent and flavor of lemon! 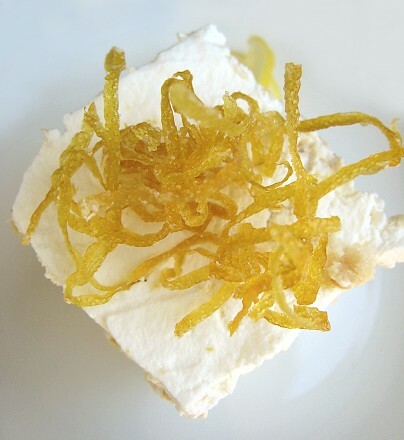 For our lemon chamomile tiramisu, we made candied lemon zest as a garnish, then decided to flavor the mascarpone-whipped cream mixture with lemon zest. In lieu of espresso, we decided to go with chamomile tea, and in lieu of Marsala wine, we went with limoncello. I must say, I denuded quite the number of lemons for this dessert. 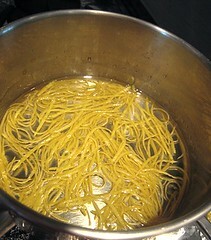 ...dumped the zest into boiling water for a little while, then drained them. They went into a simple syrup bath (1:1 sugar and water, heated until the sugar has dissolved) and then drained on a rack. I, of course, saved the simple syrup for later. I let the candied peels dry out a bit. I simply whipped some heavy cream, added the tiniest amount of sugar, then the zest (grated, this time) from several lemons. I wanted to use mascarpone cheese in this mixture as well, but JS didn't find any at Costco, and the nearest market that had it priced it (the same brand, mind you) at about four times as much. We had to make a special trip to buy limoncello! Oh, the things we do for the blog. I brewed several chamomile tea bags, added limoncello to the mix, then combined this with the lemon-scented simple syrup used for making the candied zest, and a touch of lemon juice. I did the standard tiramisu assembly procedure, starting with the lemon-scented whipped cream, dipping ladyfingers into the chamomile-limoncello syrup, then layering them on top of the whipped cream. I repeated the process, learning it's much easier to break the ladyfingers into small pieces to fit into my round serving container, until I reached the top. 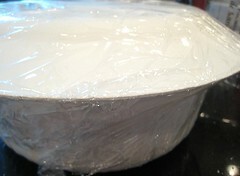 I finished with a final layer of the whipped cream. I didn't want to ruin that nice smooth layer of whipped cream I had on top, so I covered my tiramisu with a plate before placing the plastic wrap over it. Into the refrigerator it went and we had to wait until the next day! 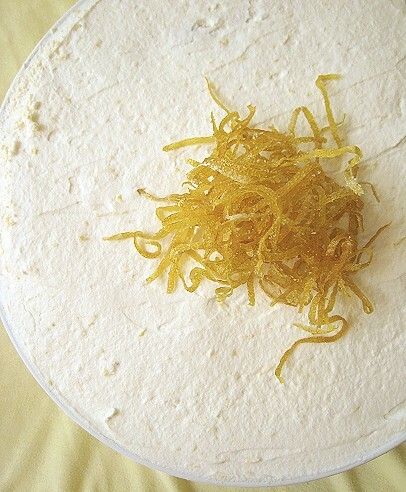 The next day, I decorated the tiramisu with the candied lemon zest. Ta-da! I must say our lemon-y take on the tiramisu was quite delicious. On the whole, it was not too sweet, it had a rich creaminess to it from the whipped cream, and yet it was light and refreshing at the same time. 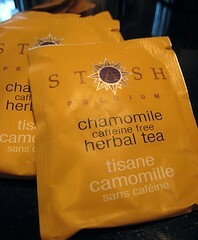 Lemon and chamomile go really well together. The "boozy" note from the limoncello adds another nice flavour dimension. 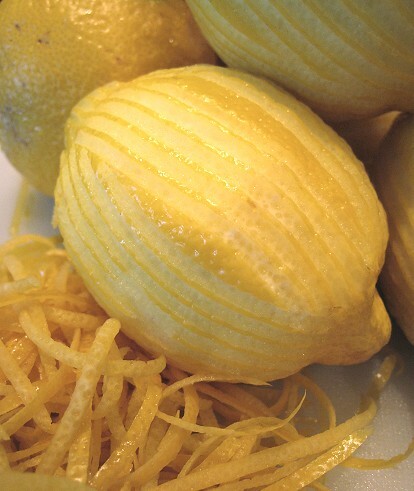 Zest the lemons into long strips. 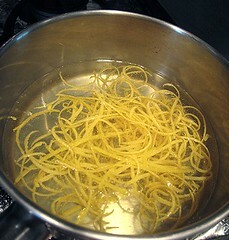 Bring some water to a boil, then add the lemon zest. Boil for about a minute. Drain and discard the water. In a small saucepan, make simple syrup by heating sugar and water until the sugar has dissolved completely. Add the drained lemon zest and let sit in the syrup for about 5 minutes or so. 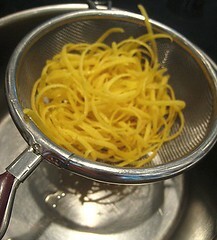 Drain the zest and reserve the simple syrup. 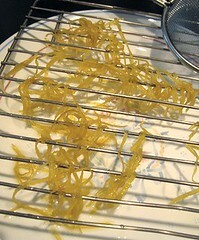 Let candied zest air-dry on a rack. Zest lemons using a micorplane. 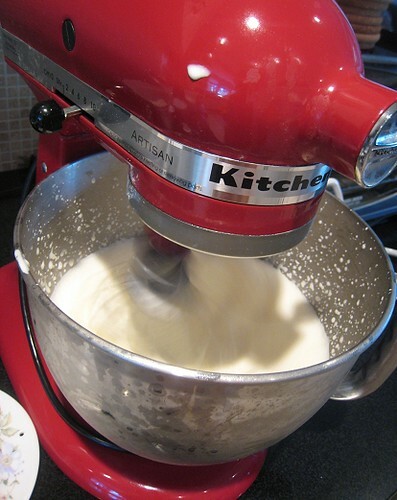 Start whipping the heavy cream until soft peaks form, adding the sugar and zest halfway through. 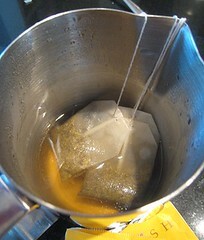 Pour boiling water over teabags and let steep for 5 to 10 minutes. Remove tea bags. 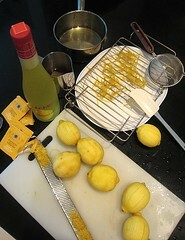 Add limoncello and lemon juice to the tea, and combine everything with the reserved simple syrup from making the candied zest. 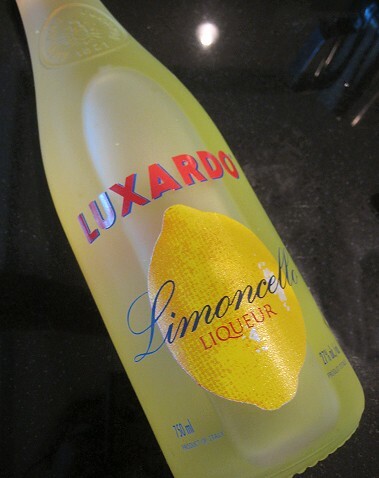 You may add more limoncello and/or lemon juice according to your taste. To assemble the tiramisu, spread bottom of your cake pan or serving container with a little bit of the lemon-scented whipped cream. Dip first side the ladyfinger in the chamomile-limoncello syrup for 1 second, flip and dip the second side for 1 second. 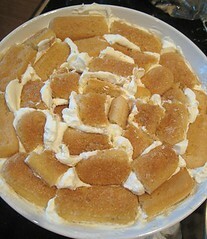 Layer the dipped ladyfinger onto the whipped cream. Repeat this until the first layer has been filled with dipped ladyfinger cookies. 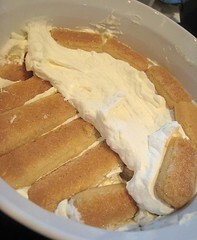 Repeat the process -- whipped cream, then dipped ladyfingers -- until you reach the top of your pan/serving container. 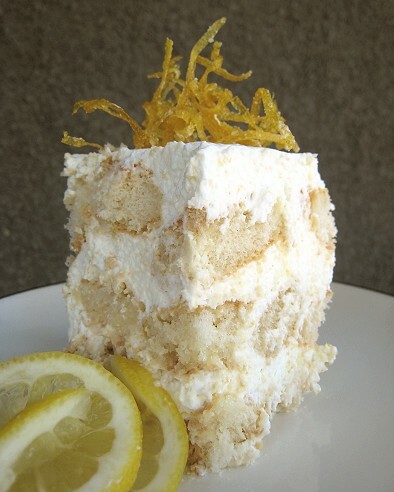 Finish the tiramisu with a final layer of the lemon-scented whipped cream. 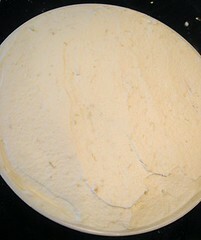 Cover tiramisu and place in the refrigerator for at least 8 hours to set. 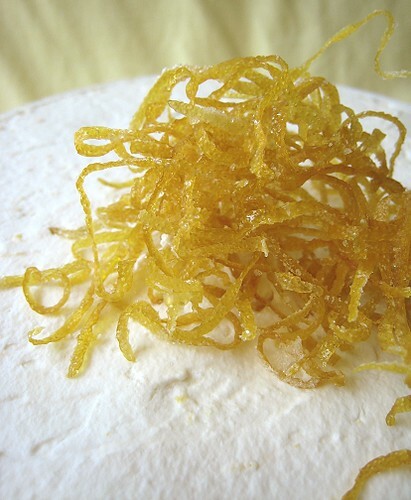 To serve, garnish with candied lemon zest and enjoy! The host this month is Wandering Chopsticks herself! What an absolutely wonderful dessert. It really is wonderful. Lemon and chamomile...ahh....I want a slice with a cuppa pls. 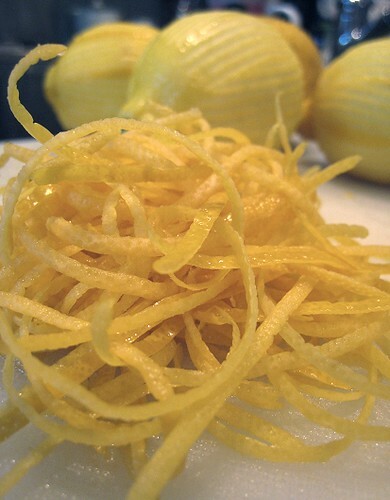 The lemon zest is a work of art. Great looking tiramisu! 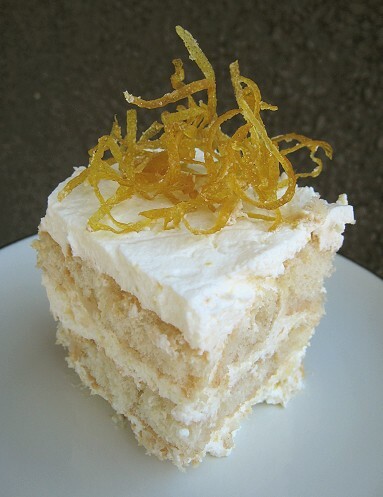 I love your use of the limoncello to dip the lady fingers. 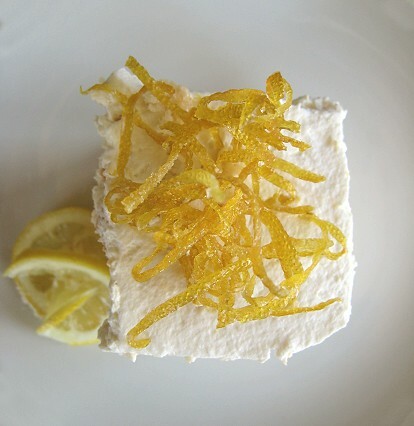 A lemon tiramisu is a great idea! It looks wonderful! Thanks! Coming from someone pastry-y such as you, that's certainly a compliment! Thanks. I think I can only do the "messy" aesthetic. I tasted the limoncello by itself first, and whoa -- alcohol city! But it provided a nice boost to the tiramisu. I love how this recipe -doesn't- use marscapone! It looks delicious. I'd say its a keeper. It sounds delicious. I am so bookmarking this one. Would love to see your version. Because I made my own Limoncello instead of buying it at the liquor store, I had to wait a whole month!! It was well worth the wait though because this tiramisu is absolutely divine!! Thanks again!! I certainly will be making this over and over!! :) Cheers! Sheila from Elements. Not sure if you'll see this, since the post is so old, but I noticed your comment about the price of mascarpone. I had the same problem, until I learned to make it for myself. Simple.